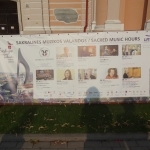 The Sacred Music Hours is a cycle of summer concerts of organ music in Lithuania started in 2003. They are a part of The Christopher Summer Festival. With a structure of "festivals within a festival", it is the largest and one of the most impressive series of summer music events in Lithuania, that runs June to September. The cooperation of the music festivals organizers and performers with world-renowned musicians accelerates the acceptance of Lithuania's musical culture and its political activities into the international realm. 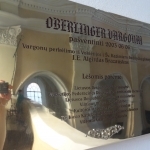 Professor Leopoldas Digrys who is synonimous with Lithuanian organ culture, started a tradition of the Sacred Music hours on Sundays at 1PM in Vilnius Cathedral (at the time, officially known as Vilnius Picture Gallery) in 1963. Later the event was moved to St.Casimir church, where a Center for Religious Music was established. These Sunday organ concerts are held to this day. In 2001, Maestro Digrys became aquainted with Dr. J. P. Kazickas (1918-2014). 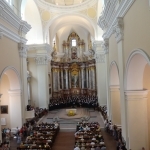 It was during the celebration of the 60th Wedding Anniversary of Mrs. A. and Dr. J. P. Kazickas, that a concert took place in St. Casimir Church in Vilnius. In the beautiful jubilee a Lithuanian tenor Virgilijus Noreika, soprano Irena Milkeviciute, violinist Vilhelmas Cepinskis, the Lithuanian Chamber Orchestra, the Lithuanian radio and television children's choir perfomed. Maestro Digrys played on an electronic organ since the original church organ was destroyed during soviet times, once the church had been converted into a museum of atheism. 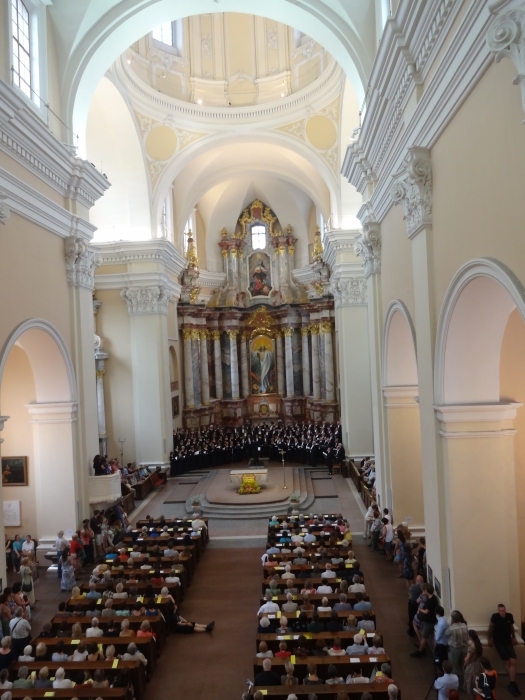 All the concerts and contests of the national and international levels held in St.Casimir Church were performed on the electronic organ. 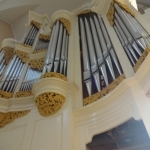 In 2003, the Oberlinger Organ was finally built thanks to significant contributions of Dr. J. P. Kazickas and his nephew Mr. G. Gruodis. 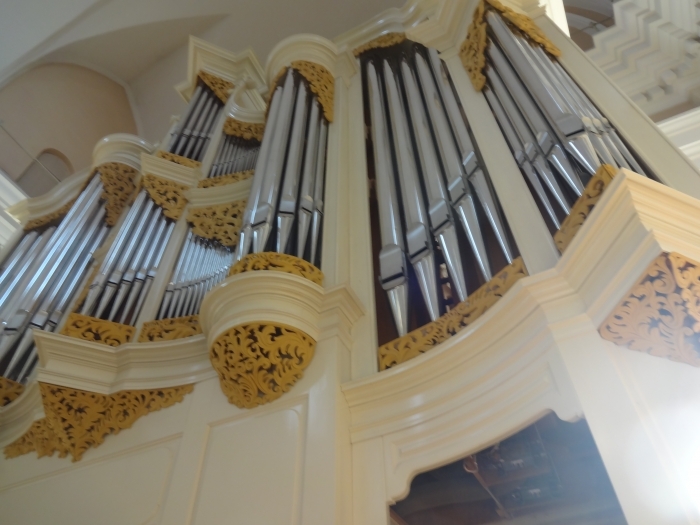 The Organ has been recognized as the best one in Eastern Europe. The same year, Dr. J. P. Kazickas became a patron of the Summer Sacred Music Hours within the Christopher Summer Festival. 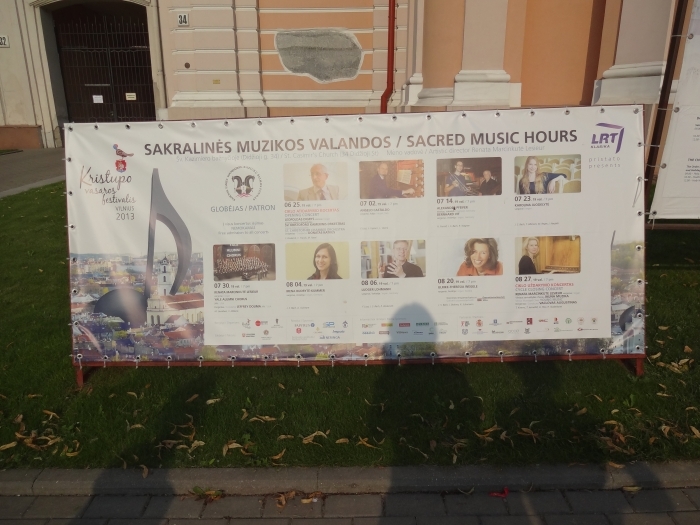 During the festival, the organ music concerts travel outside Vilnius to other towns of Lithuania, wherever organs suitable for religious music concerts exist. In 2015, the cycle of summer concerts of organ music was renamed to The Kazickas Family Sacred Music Hours.